This puzzle connects to an upcoming post on one set of figurate numbers, named The Triangular Numbers. 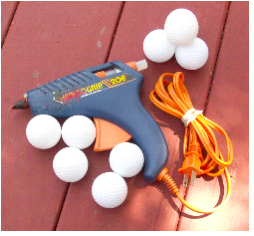 To build the puzzle, you need a glue gun and twenty plastic practice golf balls. Golfers use these to practice the swing in the backyard without terrorizing the neighborhood. 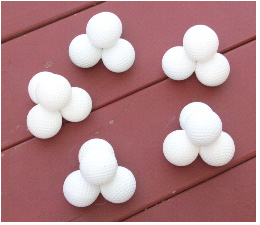 The golf balls cost a couple of buck a dozen and are available at any of the chain stores. The puzzle was invented during a math workshop I was leading for fourth grade teachers. 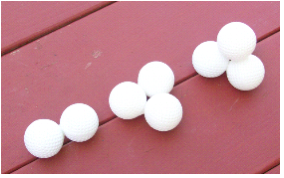 We were gluing plastic practice golf balls together as part of our study of figurate numbers, Paula, one of the teachers, had glued three golf balls to form a triangle and then glued a fourth on top of the other three to form a pyramid shape. A triangular-based pyramid is called a tetrahedron. So, just as Paula did, you, or the grandkids, glue two, glue three, and then glue the fourth on top of the three, as shown is this picture. This is a good project for teaching the grandkids how to safely use a hot-glue gun. As Paula was showing her creation to the group, someone wondered out loud if some number of these small tetrahedrons would form a larger tetrahedron. 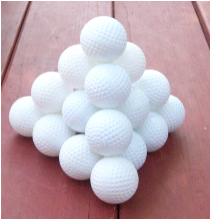 The group started gluing golf balls together and it was soon discovered that five of the small tetrahedrons would form a larger tetrahedron. That’s Paula’s Puzzle. Use the five small tetrahedrons to build the larger tetrahedron shown below. Serendipity is when the unexpected happens. Unplanned, the group had moved from our study of two-dimensional figurate numbers (see the Triangular Numbers post) into a study of three-dimensional figurate numbers. What thrilled me most, as leader, was that the group knew and understood the arithmetic underlying the puzzle. In a later post, I will connect the Triangular numbers to Paula’s Puzzle. For right now, teach the grandkids how to safely use a glue gun, make the puzzle pieces and, as I learned to say teaching in New South Wales, Australia, “give it a go”! Oh, here’s a short video that shows the solution.